Performs random name drawing for your holiday or other occasion gift exchanges. Participants do not have to be together to conduct the drawing. Results can be automatically emailed or text messaged to each participant. The operator of the program does not need to see the names drawn. Participants in the drawing may be chosen from the device contacts, or entered manually. Grouping feature allows exclusions of spouses or group members from drawing a name in the same group. Memory of previous drawing prevents people from drawing the same name as the previous drawing. Each participant may be designated as "Gives and receives a gift in shared exchange", "Gives and receives in shared exchange, also may give to receive only participant(s)", "Does not receive gift, may give to receive only participant(s)", or "Does not give gift, receive only. For example, child". The results can be printed to an Airprint printer for each participant without email, or who want a printed copy. History display shows the name drawn and gift given for each person for previous drawings. Compatible with PC Gift Exchange files. You may email your *.gx files from PC to yourself and open on iPhone, iPad, or iPod touch. Multiple exchanges may be created and saved. For example, an exchange file can be used for your direct family. A separate file may be used for an exchange for your spouse’s family. Optional gift suggestions may be included in notification emails. 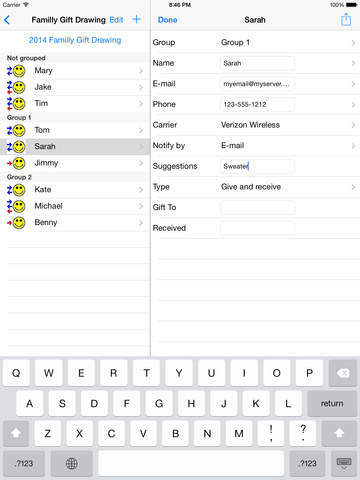 The organizer may add any suggestions received and the option will appear to notify the person who has that name. Fixed problem that gift suggestion changes may not be saved in some cases. Added validation and ability to re-draw only part of exchange if people are added or removed after drawing names. Added smtp send method.